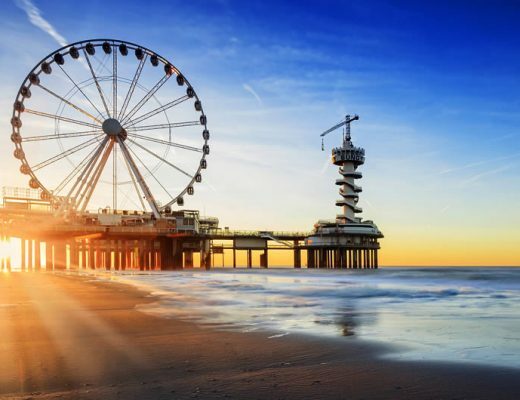 You can travel from Amsterdam to the most southern tip of The Netherlands in just a little over 2 hours. 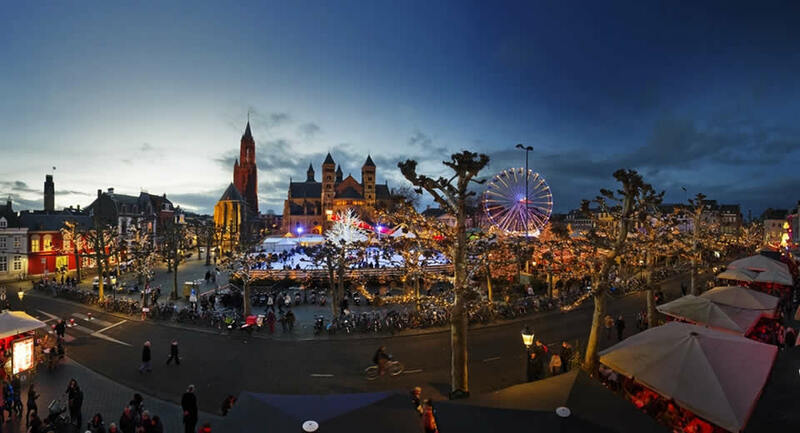 Then you will find yourself in Maastricht, one of the prettiest cities in the country and one of the best cities to visit in wintertime. 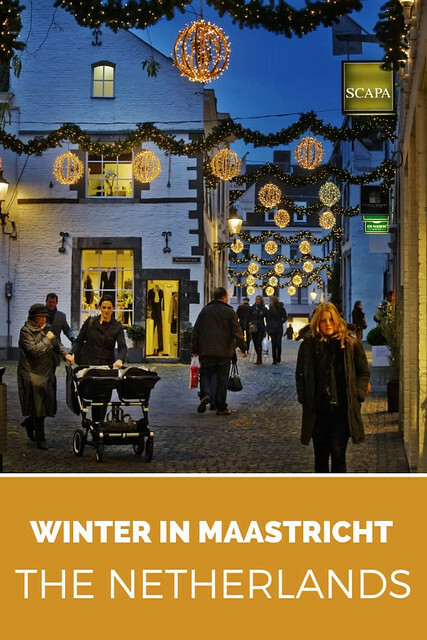 Winter in Maastricht is like a fairytale, with prettily lit streets and squares, the largest Christmas market of The Netherlands, and plenty of amazing shopping and dining to be done. 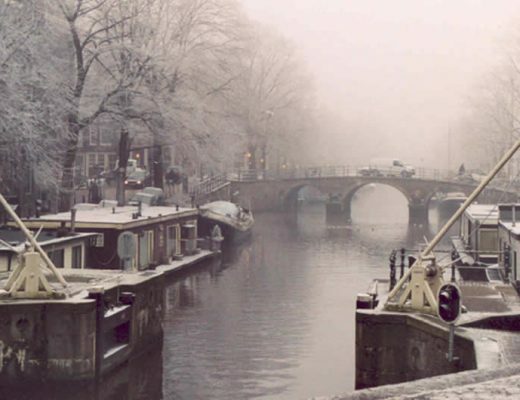 So, grab your gloves and head to the warm and cosy south of The Netherlands. 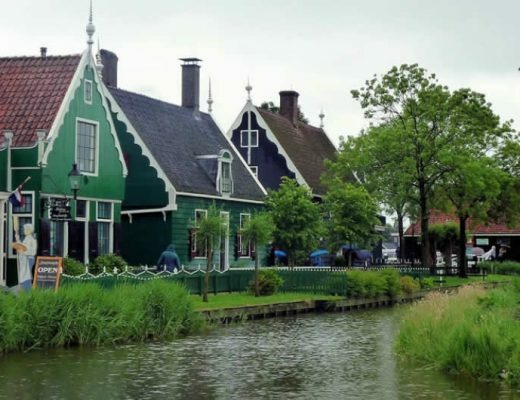 Whenever I write about spending time in The Netherlands in winter, I get loads of comments saying ‘I thought Holland was only worth the visit in spring, but this looks great!’. Well, I guess I am hoping for the same surprised reactions after you read about spending time in winter in the beautiful city of Maastricht. If you’d like to give it a go (and please do), check the end of this article on how to get to Maastricht: it’s just so easy. Vrijthof is the proud central square of Maastricht and one of the prettiest squares in The Netherlands. Throughout the year this square is lined with cafés, outdoor seating and just the place to be to enjoy a drink. During the holiday season, Vrijthof transforms into a fun Christmas village with tons of chalets to buy glühwein, something to eat or holiday gifts. If you’re into ice skating, go for a twirl on the ice ring or take a ride in the Ferris wheel for an amazing look over the city. 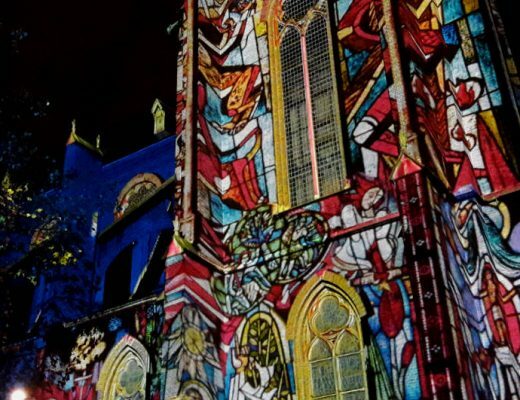 I simply loved all your comments on my article about light festivals in The Netherlands and the Maastricht light route is a yearly fun light festival. It’s not an ‘art’ festival as such, but the prettiest streets, squares, historical buildings and cultural highlights are lit up beautifully and together form a magical route through the city. 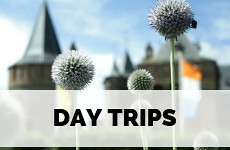 A fun way to explore Maastricht if you’ve never been. You can see the route online, or download it. Maastricht is probably the best city in The Netherlands to go on a shopping spree. Every neighbourhood offers its own special shops. 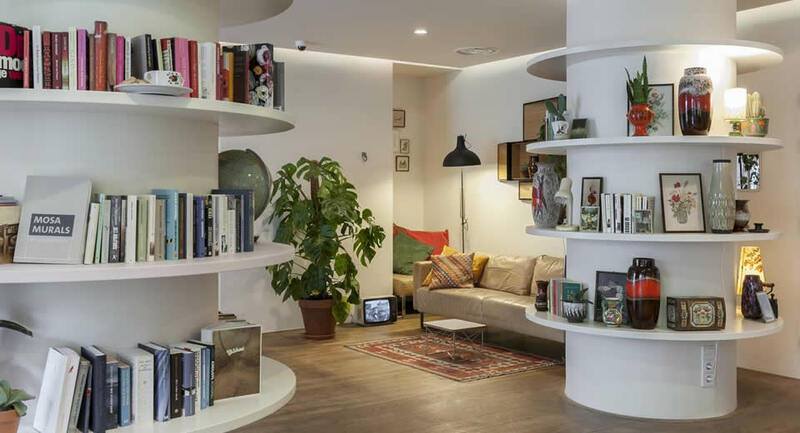 Wyck is all about hip concept stores and vintage, Stokkwartier offers upscale and classy boutiques and the centre of Maastricht has large flag stores of all famous brand and some really special shops, like the bookshop that’s set in a gorgeous 13th-century Dominican church. 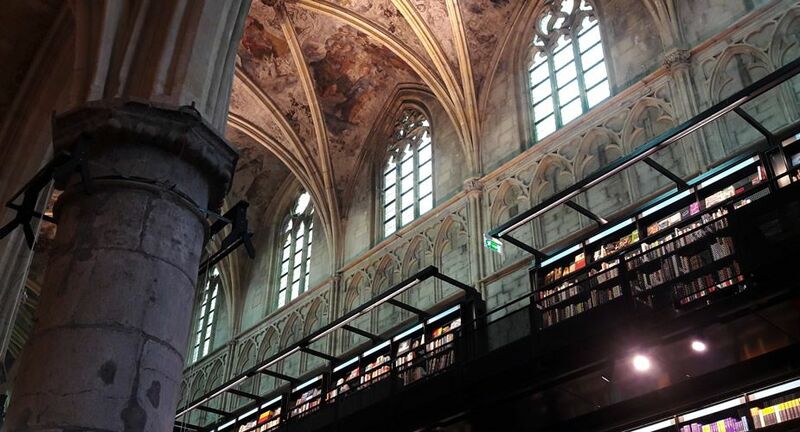 It was voted the most beautiful bookstore several times, and rightfully so. You can read all about it in my article Amazing bookshops in The Netherlands. Besides bookshop Dominicanen, I think Maastricht offers some amazing vintage stores. 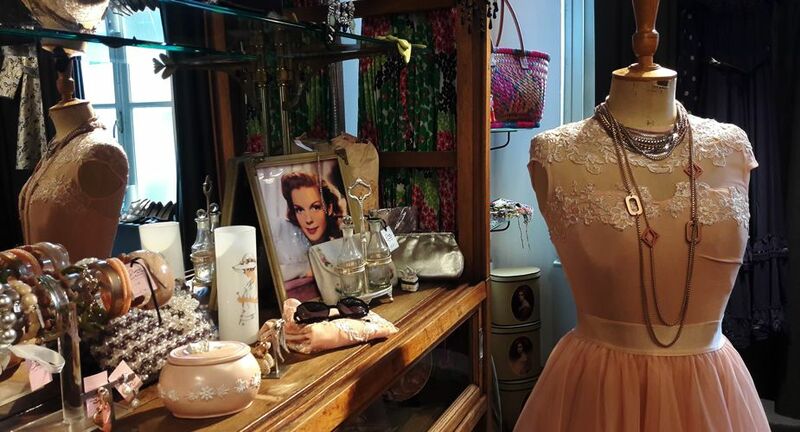 My favourite is Retro & Chic, which is my favourite vintage shop in The Netherlands, as the collection is so extended and consists of (unworn!) vintage shoes and clothes, the party dresses are just to die for. But I also really loved the jewellery, shawls and gloves. If you are into shoes (and of course you are, yes you are) please pay Noë a visit, my favourite shoe store, ever. Nië offers approximately 10 different models of shoes, but these 10 models are available in over 20 Pantone colours! All shoes are made from high-quality Italian leather (sorry vegans…) and really beautiful, well worth their money. Maastricht was once under French occupation. 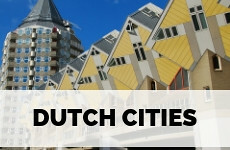 A lot of inhabitants still sport French names and when you wander the streets of Maastricht, see the fancy boutiques or study the menus of restaurants you spot a certain ‘joie de vivre’ in Maastricht and in The Netherlands we do believe that the city still is slightly French, especially when it comes to the amazing dining opportunities. Having said that, I’d like to recommend two restaurants which are fun and funky. 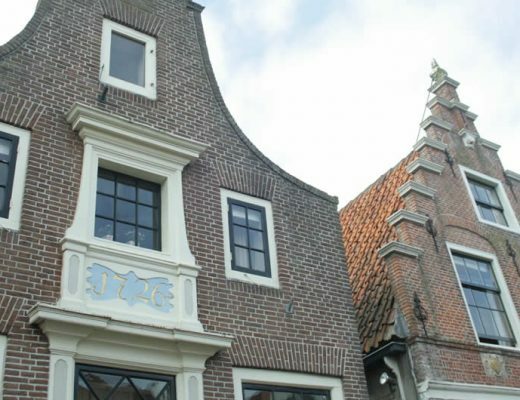 First of all, there’s Brandweer Kazerne, a café and restaurants particularly popular with the local, in an old fire station. It’s set in the upcoming Sphinx Quarter, which is really fun to explore. 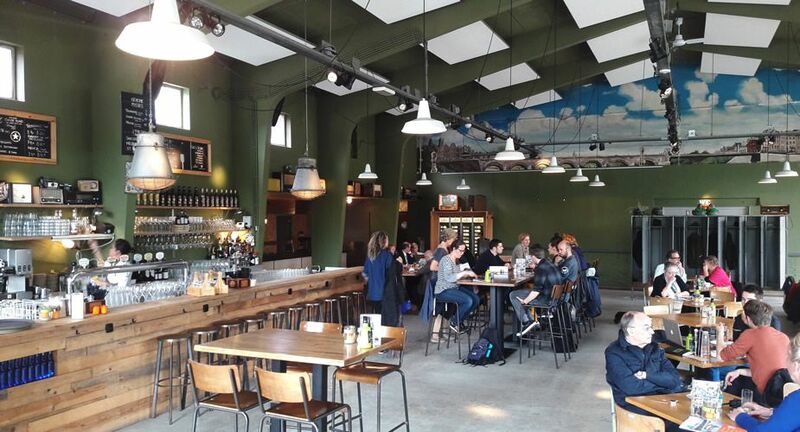 Then there’s Tapijn, which is set a little outside the city centre, a restaurant in the old army barracks and a great place to sample local craft beers. Just a little outside Maastricht you can visit Valkenburg, where every year you can visit the Christmas market in the caves of marl, inside the Cauberg (The Netherlands’ highest point), which the region is famous for. 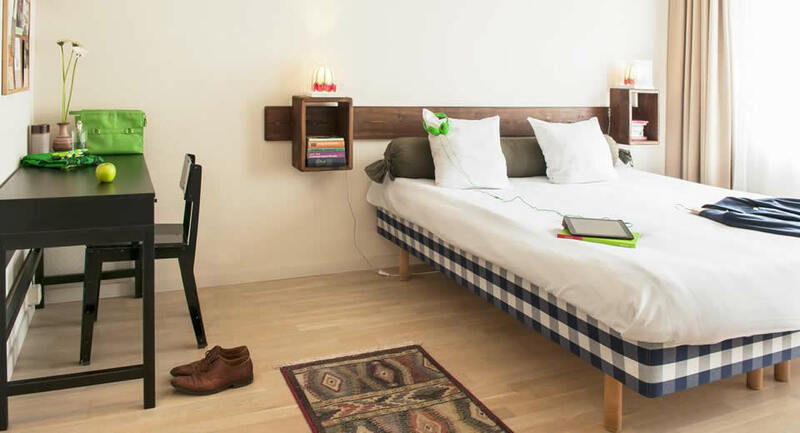 Like restaurants and boutiques, Maastricht also offers a large range of pretty (and affordable) boutique hotels. One of them being Townhouse Hotel. The hotel is set up as a house, really. The hotel rooms should feel like a real bedroom and the lounge should feel like a cosy living room. And Townhouse Hotel lives up to these expectations. The rooms are really comfy and decorated with locally produced vintage plates, street art by local artists and locally designed furniture. The rooms have excellent beds and good bathrooms. If you’d like to work there’s a small desk, though sitting down at one at the long tables of the restaurant is more comfortable. You can simply grab a drink or a snack, write down what you’ve had and pay on check out. Or snuggle into one of the comfy couches with a book or someone to chat too. Don’t forget to greet the goldfish! There’s a direct train connection between Amsterdam and Maastricht: trains run every 30 minutes and the journey takes a little over 2 hours. Check timetables here. 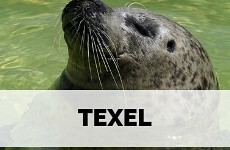 To travel on Dutch public transportation, get yourself an OV Chip Card, which you can charge as you go. 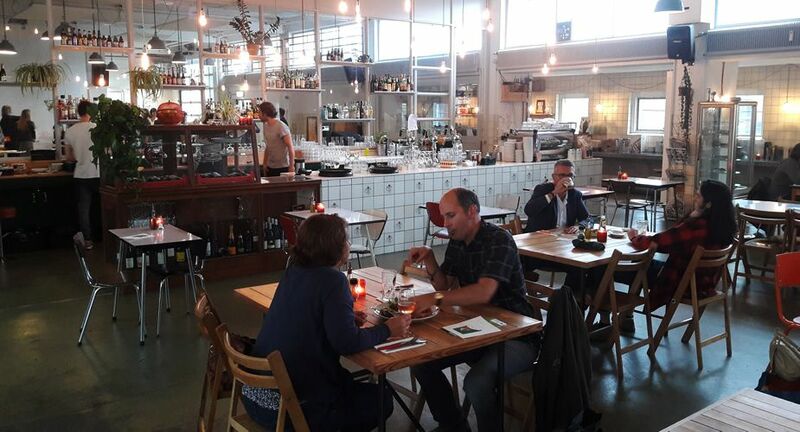 Curious about more Maastricht hotspots? 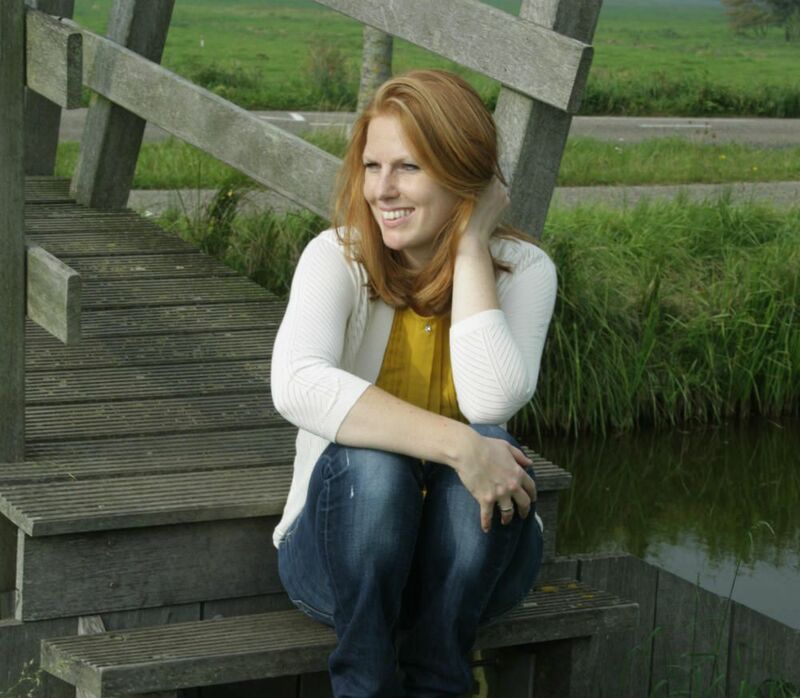 Read all about them in my article Maastricht: where to shop, eat and sleep. 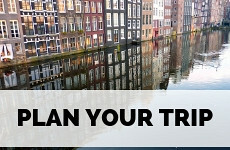 Plan your visit to Maastricht using my complete city guide Maastricht. 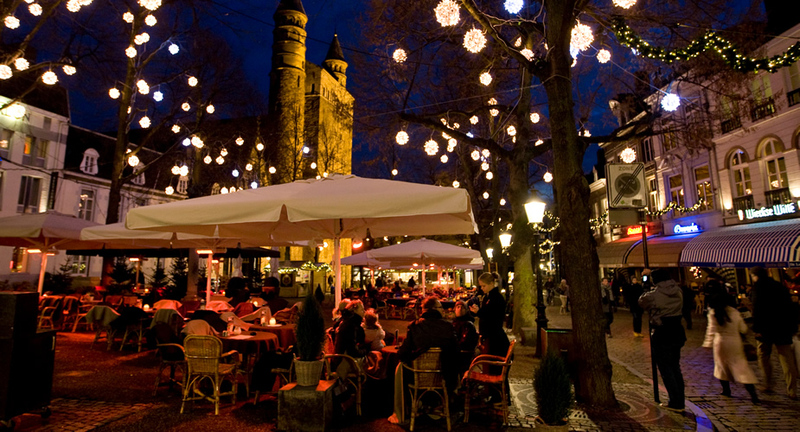 Wow, I love your photos from the Christmas market in Maastricht, the city looks really lovely with all the lights. Pinned for later! I’m so excited for Christmas Market season. This one looks magical with all the twinkling lights and a Ferris Wheel. I’d love to visit the market in the cave as well. That sounds extra neat. Maastricht looks indeed like a vey picturesque city in winter. I love that Christmas market! 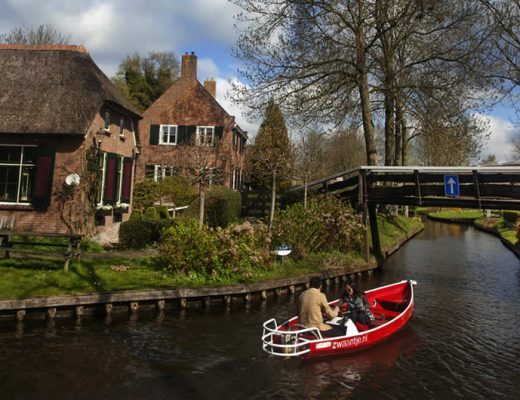 It’s wonderful that you can get there so quickly from Amsterdam. Your nighttime photos are lovely and so clear! What a charming city. I’m not familiar with Maastricht, but I see it would be a top choice for Christmas markets. The caves sound especially intriguing! Maastricht looks beautiful around Christmas and the decorations look similar to ones I saw in Belgium (understandably). It was already the city I most wanted to visit but maybe I should wait until next Christmas hmm. I do love Christmas Markets, so it’s lovely to read about one in the Netherlands, I wish I knew about this one when I visited in December a few years ago. Pinned! 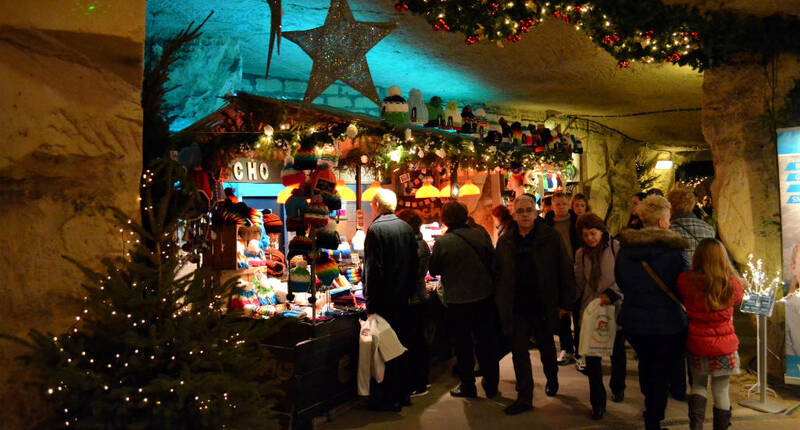 Honestly, you had us at Christmas Markets! Glad we kept reading, because Maastricht in winter just kept getting better! Although, we imagine it’s pretty great any time of year. Great post – certainly has us considering options!